The 8000S/24 is a low-cost managed stackable Fast Ethernet switch ideal for extending the port count at the edge of the network with stacking. 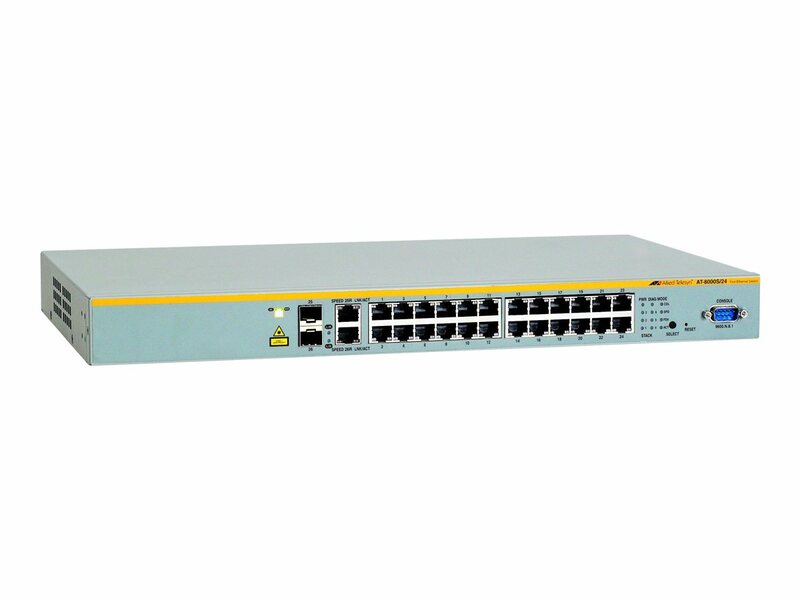 This cost-effective switch has a 1 RU form factor, two Gigabit Ethernet SFP combo bays and dedicated stacking interfaces. An extensive set of features such as link aggregation, VLANs and port mirroring can be performed across the stack. Powerful line rate performance and stackability make this switch ideal for branch offices or the wiring closet of larger offices. The state-of-the-art QoS capability of this product ensures reliable delivery of advanced network services such as voice while effectively controlling the continually increasing traffic needs found in today's networks. Featuring an industry standard CLI and Allied Telesis' intuitive yet fully featured web interface the advanced features of the AT-8000S/24 are accessible to a wide range of system administrators. The well known CLI and web interfaces significantly reduce learning time and minimize the cost of deployment. Only authorized administrators can access the management interface of the 8000S series. Protocols such as SSL, SSH and SNMPv3 facilitate this protection of your network with local or remote connections. To ensure the protection of your data, it is important to control access to your network. Protocols such as IEEE 802.1x port-based authentication guarantee that only known users are connected to the network. Unknown users who physically connect can be isolated to a pre-determined part of your network offering guests such benefits as Internet access while ensuring the integrity of your private network data. The 8000S family supports both Gigabit and Fast Ethernet Small Form-factor Pluggables (SFPs). This makes the 8000S series an ideal family for environments where Gigabit fiber switches will be phased in over time. The 8000S family allows for connectivity to the legacy 100FX hardware until it is upgraded to Gigabit. Support for both speeds of SFPs allows organizations to stay within budget as they migrate to faster technologies.